Botox was once the only treatment available to lift the eyebrows, get rid of wrinkles in the forehead and smooth frown lines between the eyes. Then Medicis introduced Dysport, which has been very popular and successful in treating the same areas. We now introduce Xeomin®. Xeomin is made by Merz Aesthetics and is pronounced zee-oh-min. It is a prescription medication used in facial aesthetics to temporarily improve the appearance of moderate to severe glabellar frown lines between the eyes (glabellar lines) in adults. 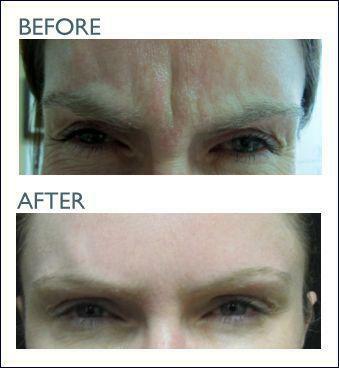 One of our patients: XEOMIN before and 30 days after Glabella Lines treatment. Xeomin contains botulinum toxin type A, a protein purified from the bacterium Clostridium botulinum, just the same as Botox and Dysport. Botulinum toxin type A (the active ingredient in Xeomin) is used in facial aesthetic treatment to treat dynamic lines like glabellar frown lines. It acts on nerve endings in muscles to prevent muscle fibers from contracting. By reducing these contractions, Xeomin can temporarily reduce the frown lines. Sometimes, when a substance is injected the body may treat it as a foreign invader, it then creates antibodies to attack the foreign substance. If this were to occur with a neurotoxin such as botulinum toxin type A, it may not have its desired effects. Xeomin is considered 'naked'. It contains no additives � just botulinum toxin type A. This may lessen a patient�s likelihood of developing antibodies to Xeomin. We use an excellent numbing cream about fifteen minutes prior to the procedure so the injections are painless. How a person reacts to Botox, or Dysport or Xeomin can't be directly compared. Results vary from person to person, even in the use of a single product. Effect generally occurs within 7 days of injection. Maximum effect typically occurs at 30 days. The typical duration of Xeomin is up to 3 months, but may last significantly longer or shorter in individual patients. It may be that one product works better for you or that a combination of products achieves the desired results. The approval of Xeomin is based on the results of two pivotal U.S. clinical trials involving 16 investigational sites and included 547 healthy adult patients. In both studies, Xeomin significantly improved the appearance of glabellar lines 30 days following the first injection, when compared to placebo. Xeomin is the only botulinum toxin currently approved in the U.S. that does not require refrigeration prior to reconstitution. Xeomin is offered at a lower price than both Botox and Dysport. Xeomin can be a great choice for a wide range of individuals including both men and women of a large age range. Our patients have been extremely pleased. We offer a free cosmetic consultation to see if Xeomin is the best option for you. Treatment is offered in both our Woodland Hills and Beverly Hills office's in Los Angeles. To find out more about Xeomin® options in Woodland Hills or Beverly Hills, please contact us today.